Dr. Billingy can help you get rid of unwanted fat without resorting to costly surgeries that come with a hefty amount of down time. Many people don’t have the days or even weeks that are generally required to heal from invasive procedures and surgical maneuvers. Varicose Vein Laser Center & Med Spa can help you slim down and achieve a more streamlined appearance without you ever having to go under the knife. You can get our body sculpting treatment and carry on with your life that same day. The best part about it is that nobody has to know about your body sculpting treatment if you don’t want them to. TruSculpt is the latest, most effective procedure for non-invasive body sculpting and overall fat reduction. Cutera truSculpt utilizes proprietary radio frequency technology, using uniform heating of the subcutaneous fat layer, sustained at a therapeutic temperature where fat cells are broken down and destroyed. 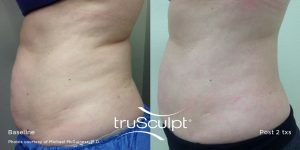 Body sculpting with truSculpt yields its most desirable results when used to treat stubborn areas of the body that have been otherwise resistant to exercise. truSculpt is also excellent for temporary cellulite reduction. When compared to outdated approaches like freezing and ultrasound, truSculpt is more comfortable, more effective, and delivers faster results. TruSculpt destroys targeted fat cells without damaging the skin surface or surrounding structures. It’s a safe and easy technique that yields amazing results without ever having to resort to surgery. Patients will be able to return to normal everyday activities immediately after the procedure. By and large, our body sculpting procedure can be done during your lunch hour. If you’d like to know more about the ways that our body sculpting treatments can benefit those stubborn areas of the body that exercise can’t quite fix, contact Varicose Vein Laser Center & Med Spa today. We are excited to offer body sculpting and many additional skincare and beauty treatments, all under one roof, for patients in Montebello, Pasadena, Downey, West Los Angeles, Monterey Park, and surrounding areas.